Life in the ICS (and later the IAS) has formed the backdrop of several interesting memoirs written by bureaucrats over the years. 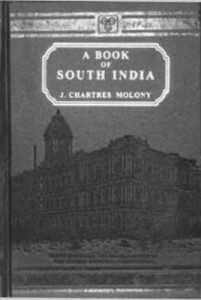 The book featured in this issue is one of the best known in the context of Madras, The Book of South India by J.C. Molony, ics (1926). Born in 1877 at Ennis in Ireland, Molony had his early education at the Portora Royal School before graduating with a BA from the Trinity College in Dublin. He joined the Civil Services on passing the exams in 1899 and came to Madras in December 1900. His appointment as Assistant Collector and District Magistrate in Trichinopoly was the first in a tenure that lasted for a quarter of a century. He retired from the Secretariat in 1925 and on his return to Ireland authored several books, the first of which forms the subject of this piece. Molony’s career took him to various places such as Trichy, Ooty, Tirunelveli and the Ceded Districts. His account of each of these places contains several interesting and hilarious anecdotes. For instance, he notes that at Banganapalle (where he was appointed Assistant Political Agent), the Nawab, Fateh Ali who did not understand English laid the letter from the Madras Government announcing its takeover of the State’s administration aside and forgot all about it until a few days later, when he summoned the interpreter who conveyed the sad tidings! His pithy observation at the State’s financial muddle which he attributed to the inability of the rulers to recognise that their personal and the State’s property were separate entities holds true for many a kingdom in the country. Molony was appointed President of the Madras Corporation in 1914, a position he held till his transfer to the Secretariat in 1920. The chapters dealing with his tenure in the Corporation and short accounts of his interactions with various influential personalities of his times are the best ones in the book. Madras, he writes was a “costly city to administer, its size out of proportion to all population”. The Madras Corporation, he says “was poor with an income of about 280000 pounds per annum” and that it had to “sit dharna at the gates of the Government for grant-in aid”. The revenues were derived mainly from a house-tax of 18% on rental values and included taxes for water and drainage services. The licence department was yet another source of income, where money was raised by “sale of permission to break the law”. Reading his accounts of street encroachments, it is striking to see how little things have changed over the years! It was during Molony’s tenure as President of the Corporation that the residents of the city were supplied with chlorinated water for the first time. This was essential as filtered and unfiltered water were mixed to cater to the growing needs of the population. The resultant mixture was christened by Sir P Rajagopalachariar, Member of Government in charge of Local Administration as the “Molony’s Mixture”. His encounters with Sir Pitty Theyagaroya Chetty, who in 1921 became the first Indian President of the Madras Corporation make for delightful reading. Calling him the “Nestor amongst his fellow Councillors”, Molony says that Theagaraya “opposed everything that was new, for at the bottom of his soul there was, I think, a suspicion that nothing less than 200 years old could possibly be safe or praiseworthy”. He however accords him great respect as an absolutely honest man who loved the honour and dignity of the Corporation. Writing of his encounters with Annie Besant, he says that liked her, for “no one could help liking an old lady so vivacious, so witty, so good humoured and so obviously sincere” but goes on to add that she never looked before she leaped and that “not only did she leap into trouble herself, but she occasionally dragged others after her”. The book is a must read as a fascinating account of life in South India in the early years of the twentieth century, written with a healthy dose of humour and a great eye for detail.